Samcheok Museum Map dated 1884 - 1888? 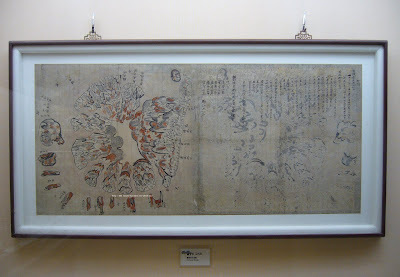 The map shown below is an old, undated inspectors map of Ulleungdo that is on display at the Samcheok (三陟) Municipal Museum. It shows Ulleungdo with two neighboring islands labeled as "Big Udo" (大于島 - 대우도) and "Small Udo" (小于島), which represented Ulleungdo's neighboring islands of Jukdo (竹島 - 죽도) and Gwaneumdo (觀音島 - 관음도), respectively. It also lists, on the map, the titles and numbers of people who were part of the inspection team during that particular inspection. 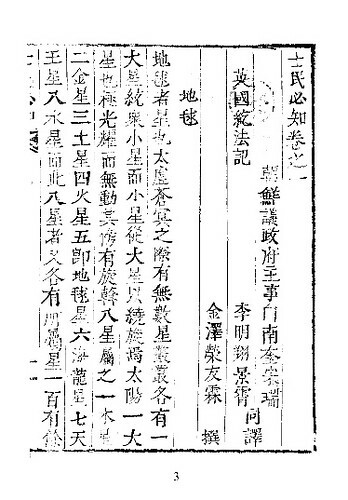 The leader of the inspection team was listed by his title, "Yeongjang" (營將). 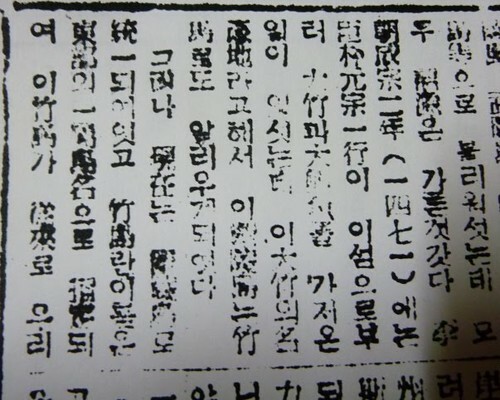 From 1884 to 1888, a Korean official with the title of "Samcheok Yeongjang" (三陟營將 - 삼척영장) was charged with inspecting Ulleungdo. 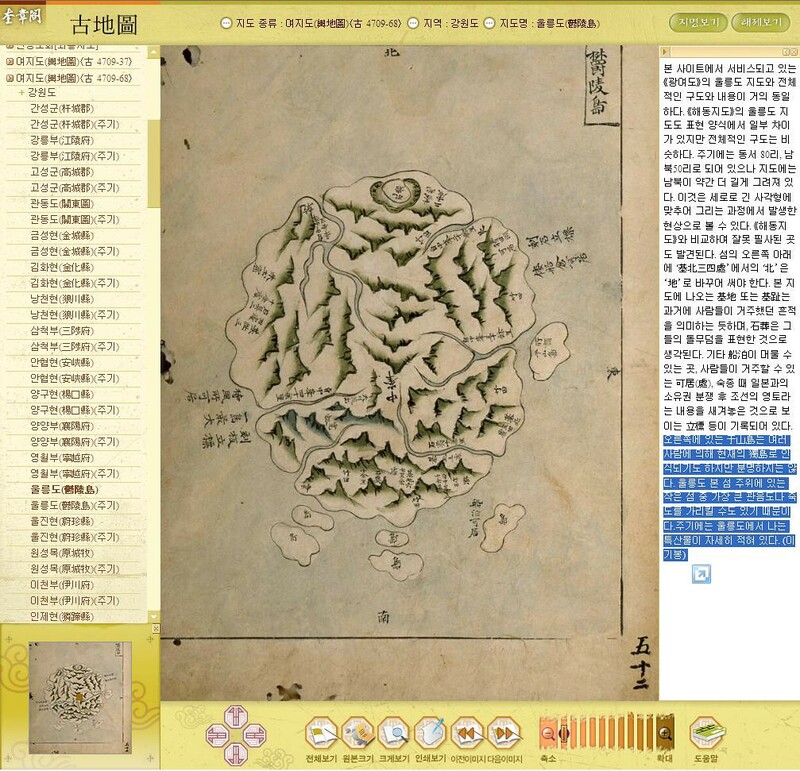 The fact that the map below lists the leader of the inspection team as "Yeongjang" (營將) and that it is, in fact, displayed in the "Samcheok" museum suggest the map was made sometime between 1884 and 1888. Another reason I believe the map was made between 1884 and 1888 is that it showed and named Ulleungdo's two neighboring islands, which was done on only two other old Korean maps. 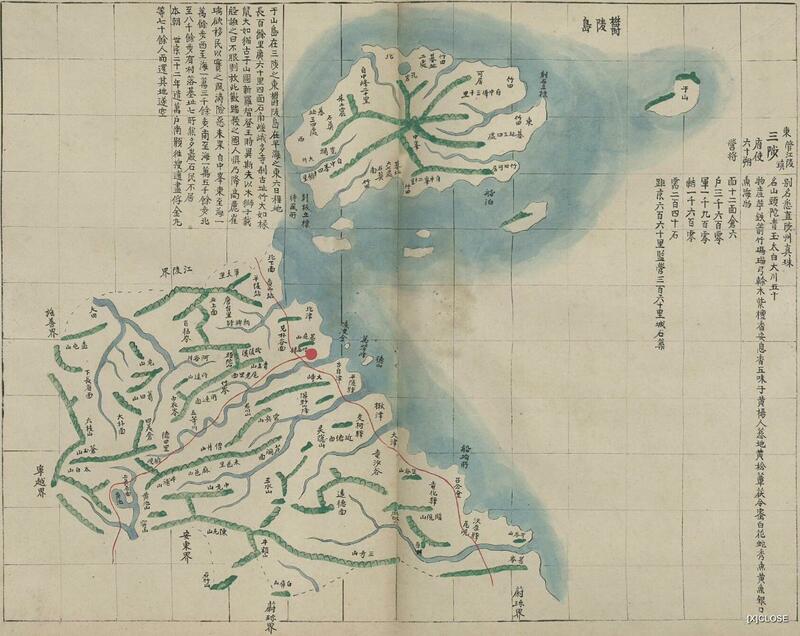 One of the other maps was Inspector Lee Gyu-won's 1882 map of Ulleungdo. 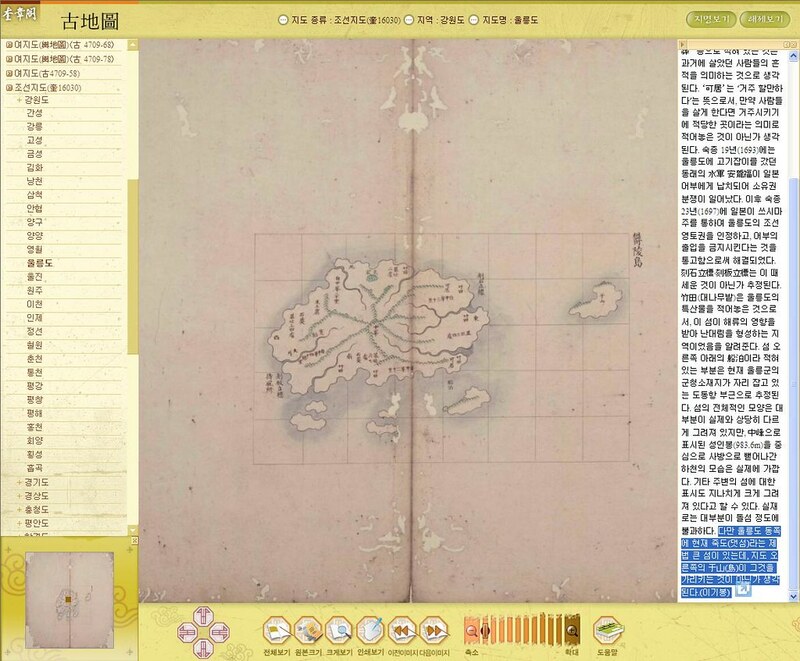 I believe that the map below was made after 1882 since it seems to have adopted Inspector Lee's new concept of viewing Gwaneumdo (觀音島 - 관음도) as an island rather than as a promontory. 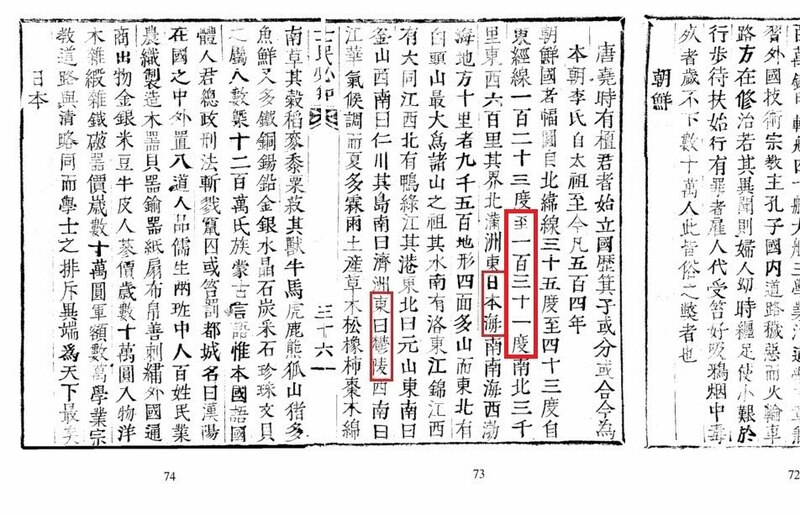 Below is a map of Samcheok (三陟 - 삼척) and Ulleungdo (鬱陵島 - 울릉도), from the 1893 atlas "Yeoljae Chwalyo" (輿載撮要 - 여재촬요). The map shows that Ulleungdo was associated with Samcheok in 1893. 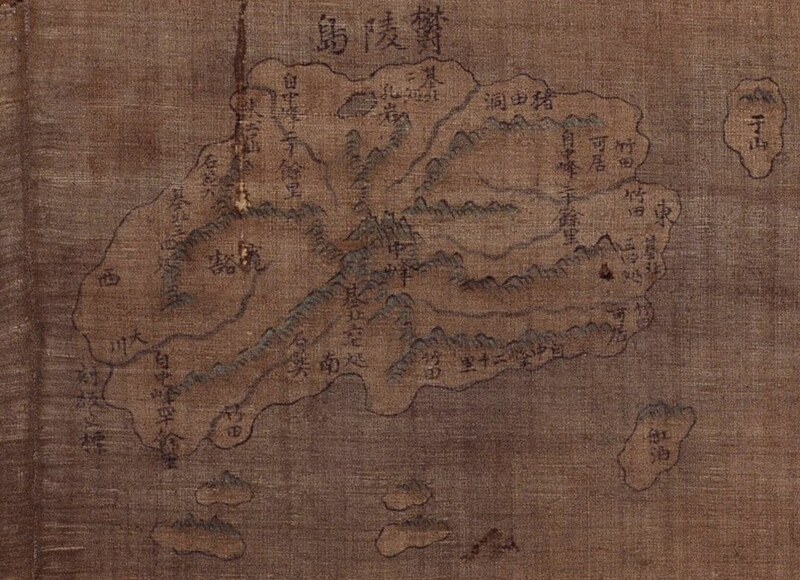 The map also shows a single island off Ulleungdo's east shore labelled Usan (于山). Usan was the old Korean name for Ulleungdo's neighboring island of Jukdo (竹島), which is 2 kilometers off Ulleungdo's east shore. The map is important because it shows that Ulleungdo's neighboring island of Jukdo was still being referred to as Usando in 1893, ten years after Ulleungdo was opened to settlement. Below is a similar map, which was made sometime between 1888 and 1894. Thanks, GTOMR, for telling me about the 1893 map. 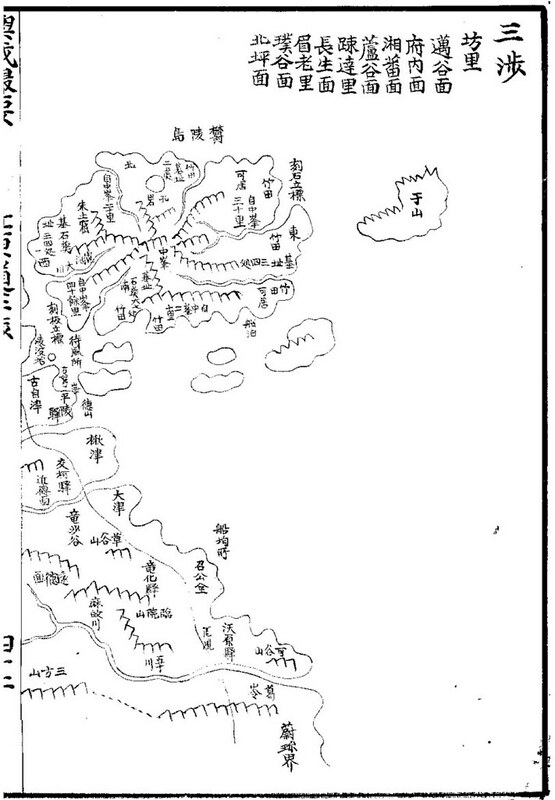 The following is a map of Ulleungdo, from a book entitled "Joseon Paldo Jido (朝鮮八道地). 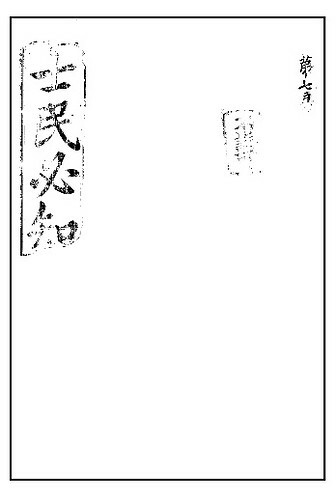 It is a cutout from a map of Pyongando (平安道), Hwanghaedo (黃海道), and Gangwondo (江原道). As far as I know, the date of the map is unknown. 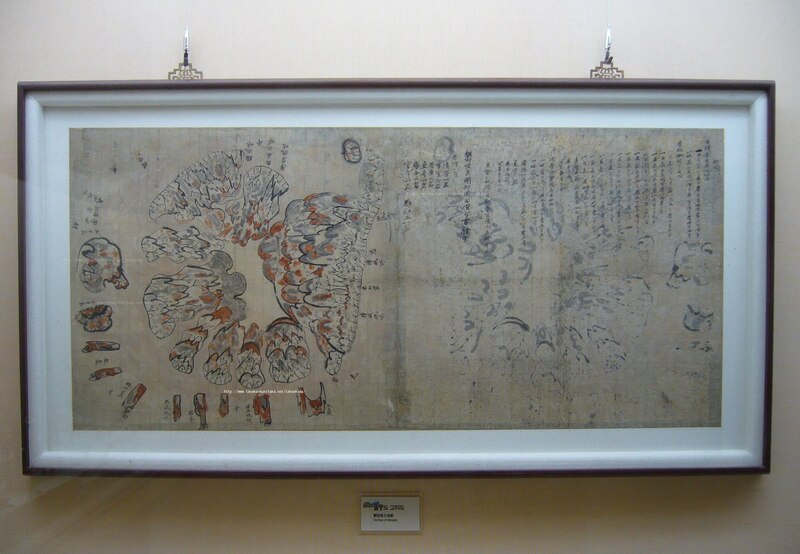 The map is stored in the Kyujanggak Institute for Korean Studies at Seoul National University. 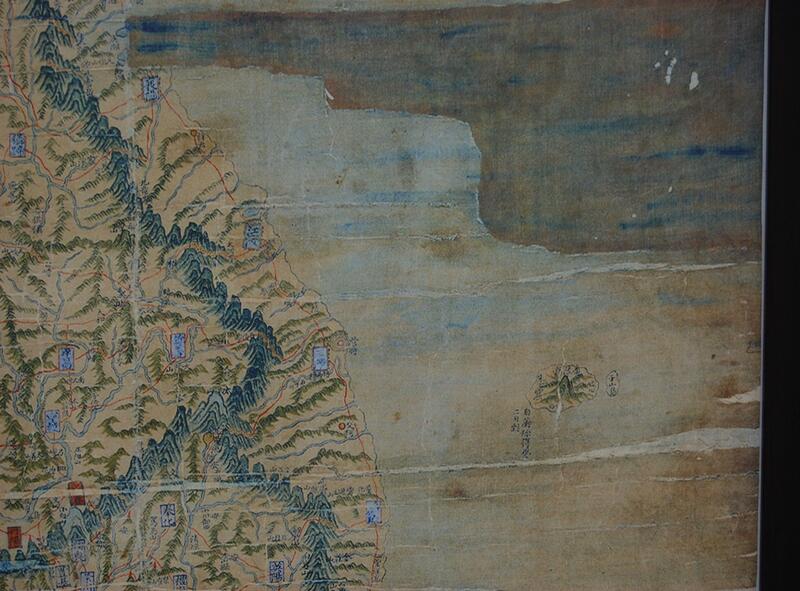 Notice that it shows a small island just off the east shore of Ulleungdo labelled 于山 (Usan). Today, Koreans call the island Jukdo (竹島 - 죽도), which is about two kilometers off Ulleungdo's northeast shore. Some Koreans claim that Usan was the old Korean name for Liancourt Rocks (Dokdo / Takeshima), but there is no Korean map or documentary evidence to support the claim. Let me know if this map has already been posted here. 1950 -中央人民政府人民革命軍事委員会作戦部測絵局 『朝鲜地图』 - People's Republic of China excluded Takeshima/Dokdo from " Map of Korea"
It looks like 中華人民共和国 (People's Republic of China) considered Ulleungdo is the easternmost of Korea. Thanks for the information, GTOMR !! 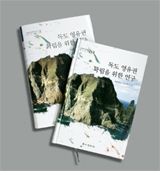 Are Koreans still interested in "Dokdo"? In August 2009, the hit counter for this site showed more than 1.1 million hits, most of which were probably from Koreans coming to this site to vote in an online survey asking if Liancourt Rocks (Takeshima/Dokdo) belonged to Korea or Japan. Before 2009, there was a great deal of Korean media and public interest in the Takeshima/Dokdo dispute, with almost weekly reports on Korean "Dokdo" protests or on some "newly discovered" map supposedly "proving" Korean claims, but that all but ended in 2009. Now the Korean media and Dokdo advocates have pretty much gone silent on Dokdo. Why? And what has happened over the past year? Sometime in September 2009, our hit counter mysteriously reset itself from about 1.1 million hits to about 12,000. Today, our hit counter shows over 100,800 hits, which means that over the past year, this site has had about 88,000 hits. That averages out to about 240 hits a day for the past year, which is a pretty respectable hit count. Therefore, there still seems to be some interest in the Takeshima/Dokdo dispute, but it seems to be silent interest on Korea's part. Koreans and their Dokdo advocates no longer come to this site to argue Korea's silly claims. Why? Probably because they no longer believe them, though they will probably never admit it. I think the Korean media and Korea's Dokdo advocates have gone silence on "Dokdo" because they and the Korean government finally came to realize that making "Dokdo" an issue was hurting Korea more than helping her. 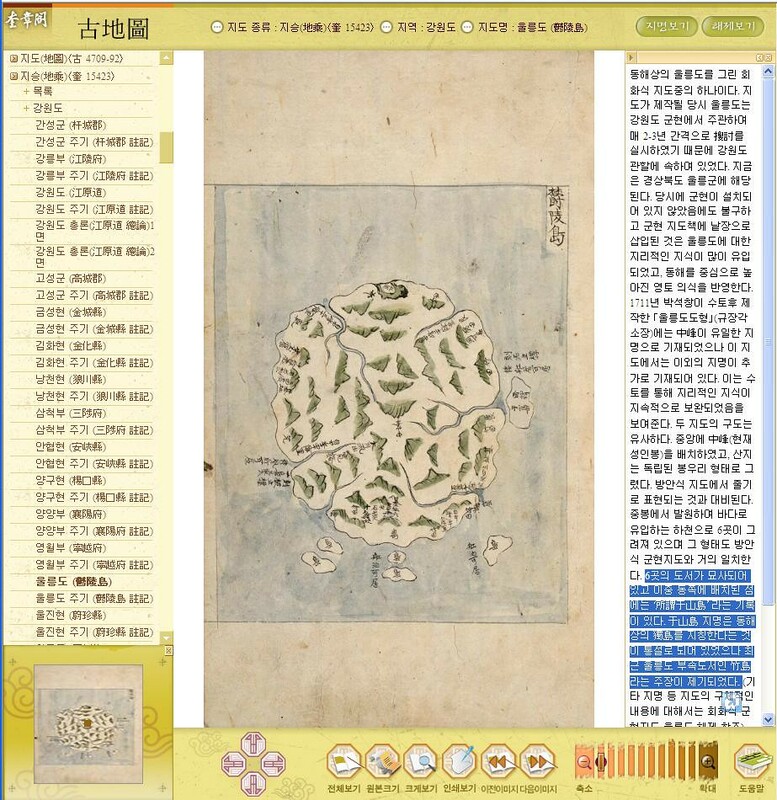 Thanks to this site and others, Korean historical claims on Dokdo have been shown to be false by using Korea's own documents and maps. Few Koreans are still arguing Korea's wild Dokdo claims because evidence disproving such claims is now scattered all over the Internet. Japan may never get back the islands that Korea illegally occupied in the 1950s, but, at least, the world is slowly coming to realize the truth about Korea's false historical claims. 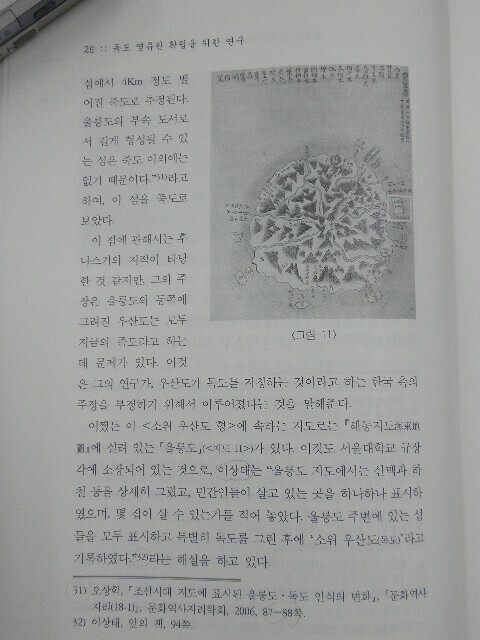 The description of the Korean geography only describes "Korean peninsula", but the description of the "islets", as shown below, included Dagelet/Ulleungdo/Matsushima, but not "Liancourt Rocks" which was found and named by French in 1949. 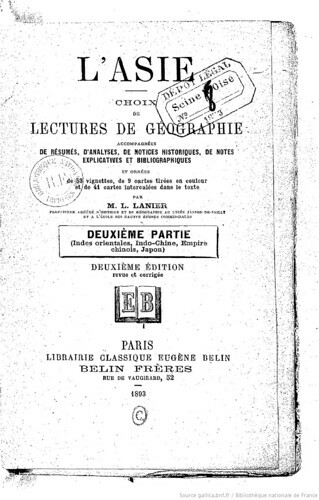 However, the map attached to the book clearly excluded Liancourt Rocks from Korean territory. 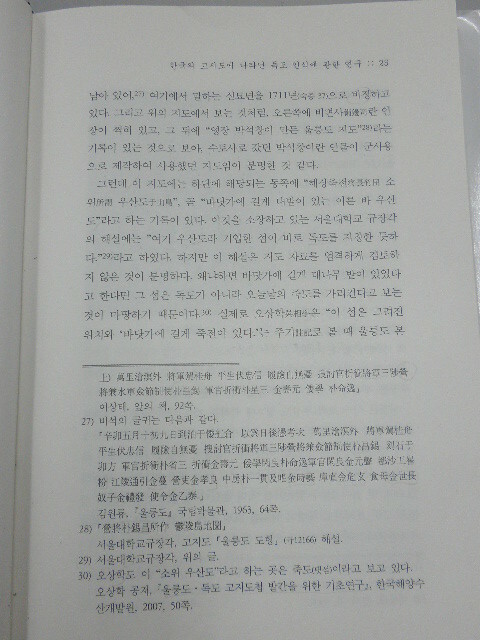 Apparently, the author Lanier considered Liancourt Rocks is not Korean territory. The Volume I of the book is available on Google Books. 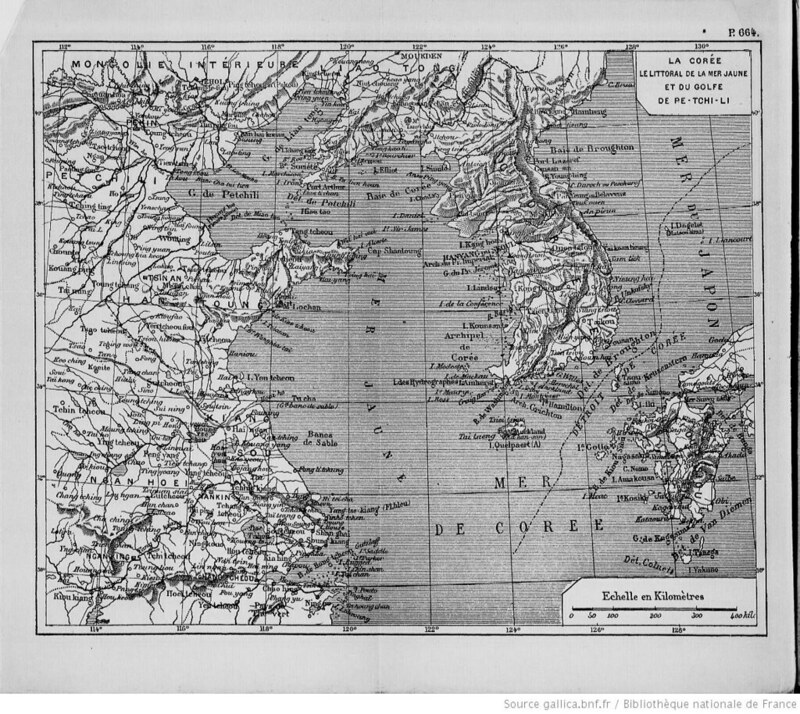 "L'Asie: Choix de lectures de geographie, accompagnées de résumés, ..."
1894 - Carte De La Coree from "Le Petit Journal"
The article of Choson Ilbo on 13th August reported that “U.S. Maps Confirm Korean Sovereignty Over Dokdo”. A map used by the U.S. while drafting a peace treaty with Japan at the end of World War II clearly indicates that the Dokdo islets are Korean territory. The find adds to a growing body of evidence that Japanese territorial claims to islets are without merit. 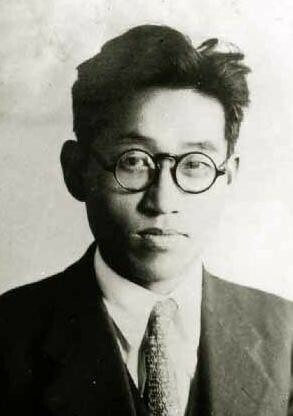 Prof. Jung Byung-joon of Ewha Womans University discovered the map in the MacArthur Memorial Archives in Norfolk, Virginia in 2008 and included a copy in his book "Dokdo 1947." It was drawn up by the State Department on Nov. 2, 1949 and sent to Gen. Douglas MacArthur, then supreme commander of the Allied Forces headquartered in Tokyo, along with a draft peace treaty. 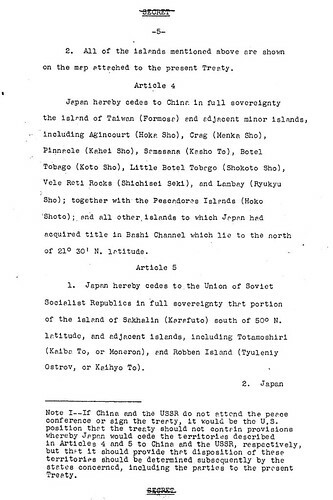 The artcle is quite perplexing since it is well-known that the Takeshima/Dokdo was listed as the territory held by Japan and remove the island from the Korean territory that it would renounce in the next draft made on 29th December, 1949, which was right after this draft of Peace Treaty made on Nov. 2, 1949. US decision that Takeshima remains as Japan's never changed in the final Treaty and Takeshima remained to be Japan's territory in the end. 2. All of the islands mentioned above are shown on the map attached to the present Treaty. 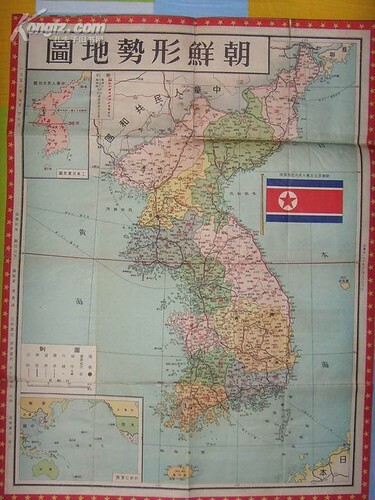 So it is quite natural that this Prof's "newly discovered" map, attached to the Draft, depicted Liancourt Rocks within Korean territory since that is what the draft on Nov. 2, 1949 said. The point is, this draft, text and map, were amended and replaced by next draft made on 29th December, 1949. 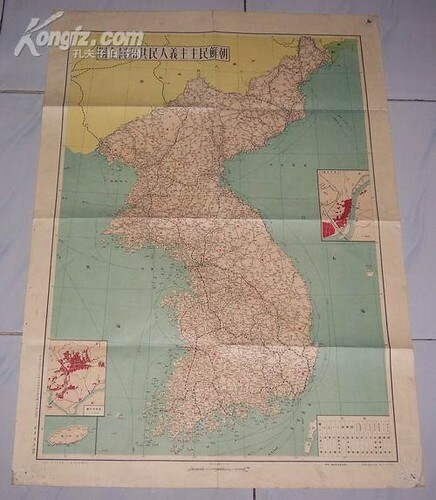 Although the map attached to the 29th Dec. 1949 draft is yet to be found, Prof. Jung Byung-joon's claim "the November 1949 map depicting Dokdo as belonging to Korea was the final version" is not true. The map is not the "final version" nor it "confirm" Korean sovereignty since it was already replaced with next draft. It’s pointless to intimidate Japan not to claim territorial sovereignty over Takeshima with this map. 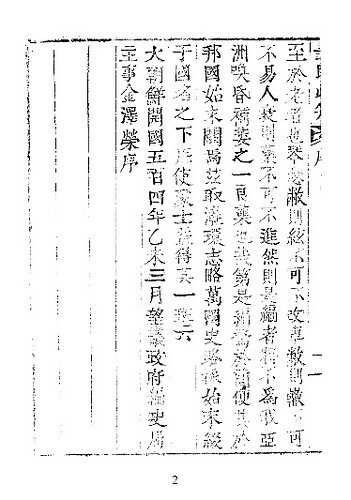 In fact, Mr. Tsukamoto Takashi from the Japan’s National Diet Library had already wrote about this drafting process of Peace Treaty with Japan in his article written in 1994. He’s already introduced the Article 6, which deals with territorial issue, of this draft of Peace Treaty made on Nov. 2, 1949 and the article clearly stated that it has attached map. The drafting process is well-written in English by Shimane’s Web Takeshima Research Center as below. The peace treaty is therefore the key to the puzzle, but how does it deal with Takeshima? 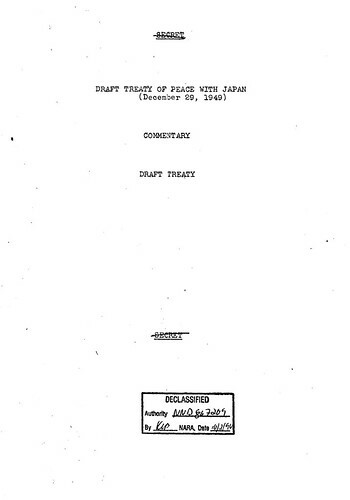 A draft of the peace treaty with Japan formulated in March 1947 defined the extent of Japanese sovereignty, which included the main islands of Honshu, Kyushu, Shikoku, and Hokkaido, as well as such outlying islands as Oki, Sado,and Tsushima. On the other hand, its provisions stated that Japan renounced the rights and title to the islands of Cheju, Komun, Ulleungdo, and Takeshima. This principle remained unchanged until the draft of November 1949. 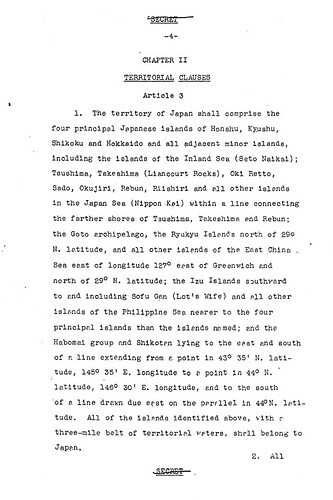 The situation began to change when the acting Political Advisor in Japan, William J. Sebald, went a note to the U.S. State Department stating, “Recommend reconsideration Liancourt Rocks (Takeshima), Japan's claim to these islands is old and appears valid” As a result, the treaty draft was amended in December 1949 to add Takeshima to the territory held by Japan and remove the island from the Korean territory that it would renounce. The later American discussions with the British subsequently adhered to this policy, and the joint American and British draft of June 14, 1951, stated that the territory Japan would renounce would be Cheju, Komundo, and Ulleungdo. This clause eventually became Article 2 (a) of the San Francisco Peace Treaty. The treaty was signed on September 8, and all that awaited was its enforcement on April 28, 1952. In response to this, the South Korean government that had taken office on August 15, 1948, demanded the revision of the Revised American and British Draft Treaty on July 19, 1951, to include both the islands of Dokdo (Takeshima) and Parangdo (a submerged island) as part of its territory. The American government rejected this demand for revision, however, stating, “Takeshima was...never treated as part of Korea and, since about 1905, has been under the jurisdiction of the Oki Islands Branch Office of Shimane Prefecture of Japan. The island does not appear ever before to have been claimed by Korea.”. 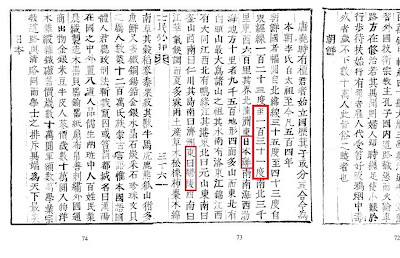 On January 18th 1952, the President of ROK Syngman Rhee (李承晩) suddenly issued a Declaration concerning maritime sovereignty, with which he installed the so-called “Syngman Rhee Line” including Takeshima/Liancourt Rocks in the Korean territory, it was three months before April when the Peace Treaty would be effective. Later, on 12th July, 1954, Korean invaded Takeshima with heavily armed forces and refuse to bring the issue to ICJ against Japan’s proposal. The Choson Ilbo’s strange discovery story continues as follows. 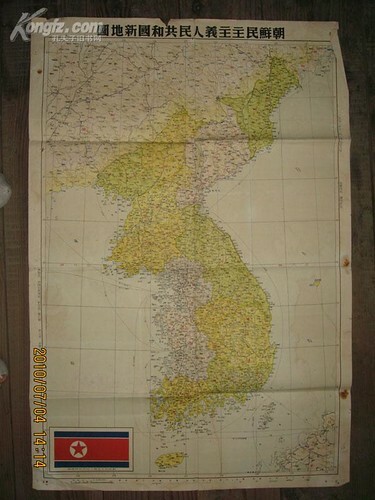 Jung also discovered another U.S. government map, equally putting Dokdo in Korean territory, that was drawn up by a policy planning taskforce of the State Department on Oct. 14, 1947 to define Japanese territory. Until recently it was believed that this map was drawn up in 1949 or 1950. The map he “discovered” is the map made by Jorge F. Kennan, the director of the Policy Planning Staff(PPS). The documents are included in the FRUS, The Foreign Relations of the United States, a book series published by the Office of the Historian in the United States Department of State. It’s even available online here. Moreover, the PPS documents are sold in the form of microfilms more than 20 years ago. How on the earth he can “discover” the map which is open to the public ages ago? 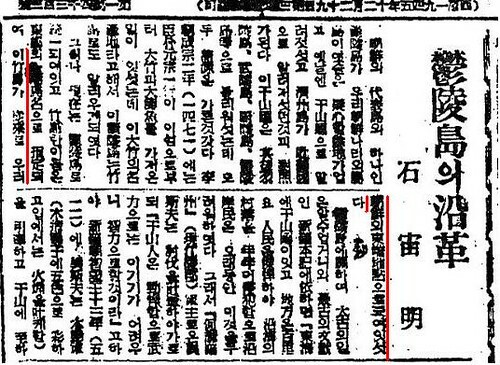 I strongly recommend Prof. Jung and Choson Ilbo to stop this kind of silly argument and claiming that he “discovered” things which are already known. 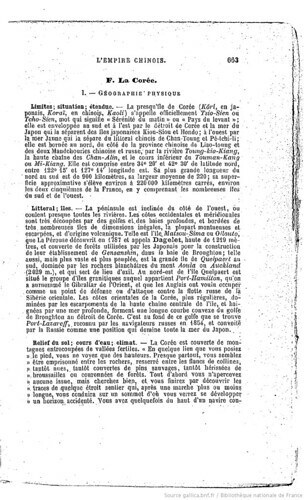 The initial information of the Choson Ilbo’s article was informed by matsu and other information concerning to the drafting process of the Peace Treaty were provided by Mr. Tsukamoto. Mr. Tsukamoto Takashi's article is written in Japanese. The article and related articles in Japanese. Korean government should stop brainwashing its own people and start educating them how to “debate” logically without resorting to violent act of terrorism immediately. 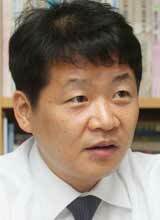 On 7th July, 2010, "The our yard Dokdo keepers”(우리마당 독도지킴이) representative Kim Ki-joong assaulted Japanese Envoy to South Korea Shigeie Toshinori(重家俊範) with a 10-centimeter's rock twice in Korea Press Center in Seoul. Mr.Shigeie avoided the attack, but Mayumi Horie, his translator, was hit in the hand and taken to a nearby hospital. I saw it on Japanese News, and it was ugly and appalling. But it was rare opportunity for Japanese viewers to see Japanese major TV news clearly reiterate Japanese government’s stance on Takeshima. Japanese media ignores Takeshima unless Korean do something stupid. From the Ministry of Foreign Affairs of Japan’s site. In the light of historical facts and based upon international law, it is apparent that Takeshima is an inherent part of the territory of Japan. The occupation of Takeshima by the Republic of Korea is an illegal occupation undertaken on absolutely no basis in international law. Any measures taken with regard to Takeshima by the Republic of Korea based on such an illegal occupation have no legal justification. More on Japanese FNN News on 7th July and on 8th July. According to Donga News, while police investigation, he cried out that he wanted to be a Ahn Jung-geun（安重根）, a terrorist who shot and killed Ito Hirobumi(伊藤博文), but he failed. According to Joong-An Daily, a South Korean foreign ministry spokesman apologized to Japan. IMO, it is Korean government herself who are agitating its own people to act on unacceptably by its own barbarised acts of invading Japanese island Takeshima without any documented evidence which support their claim that Dokdo/Takeshima have been Korean territory since 512 A.D. !? More on a Korean News.